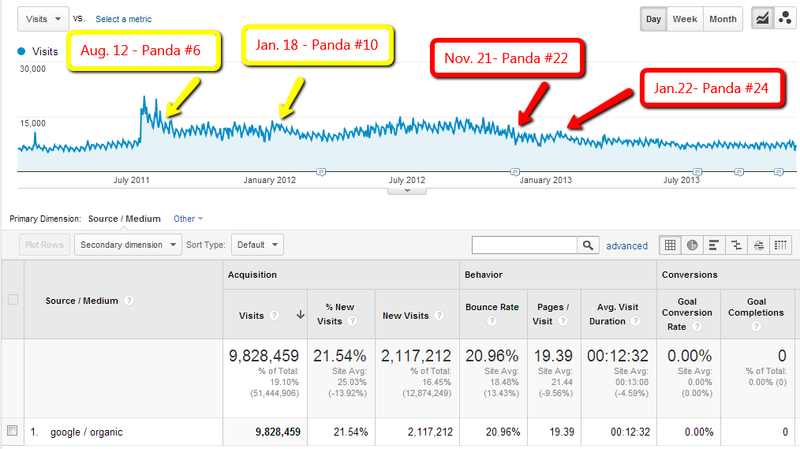 There are many great articles out there about how to find out if you have been hit by the Panda, Penguin or any other Google Algorithm Update, and what to do if you discovered that you have been impacted by an algorithm or the other. But experience has taught me tips that I haven't come across in other articles on this subject. And these are what I want to share with you today. Everything in SEO starts with analyzing your data with the help of the tracking software of your choice. And with this purpose you should analyze as much data as possible (at for least the past year). Apart from looking at monthly organic traffic coming from Google, to figure out approximately the period in which you started having problems, it is important to look at daily search traffic as well. It is normal to see some fluctuations in your daily traffic data, but you might notice that after a particular update the fluctuations slowed down, or that traffic slowly started to decrease and never recovered. 1. 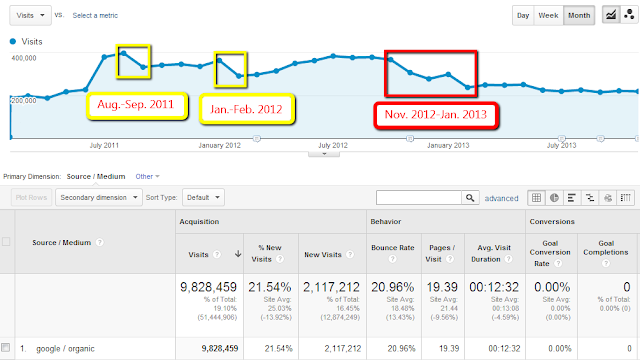 Organic traffic coming from Google has a couple of drops in the analyzed period and even if traffic eventually recovered from the first 2 decreases, it never recovered from the last big one (November 2012-Janaury 2013). 2. 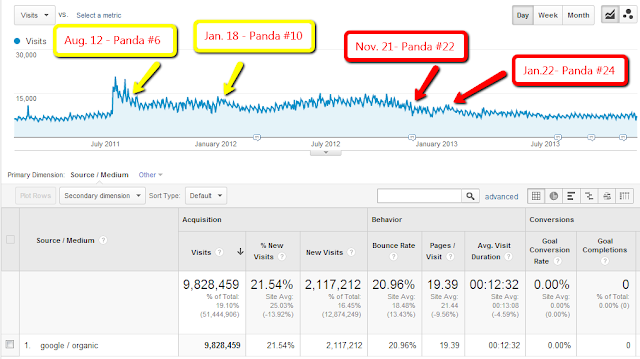 When we looked at daily organic traffic we noticed that all the drops can be connected to one of the Panda updates. If we would have analyzed the data only on a per month basis it would have been virtually impossible to figure out which update affected the website, as especially in the past period Google puts live a lot of different updates each month. 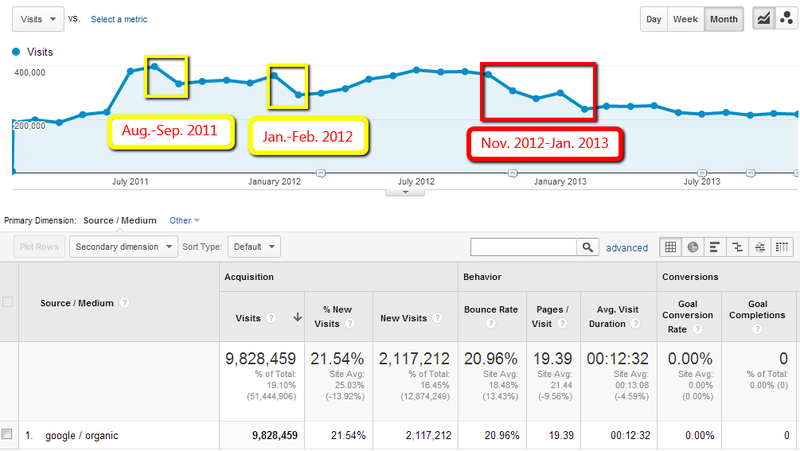 To help you with the analysis Moz created the "Google Algorithm Change History" page which you should definitely use :) As you can notice in the example below, slight drops have been registered both in August 2011 and January 2012. The first one isn't that important as it came after a sudden increase, so that might have had an impact as well, thus we are going to let is slide. The second one (January 2012) impacted the site as a general decrease can be noticed together with the reduction in traffic fluctuation, although after a couple of months traffic seemed to recover. But starting November 2012, the fluctuation scaled down (again) and when it seemed that traffic is recovering at the end of January 2013 it got hit again. Of course, it is pretty time-consuming to notice these effects, some might be even more subtle. It might help at this stage to create a separate View in Google Analytics, which you would use for the only purpose of analyzing the effect of Google Algorithm Updates on your site - in this View you could keep only organic traffic coming from Google and add annotations corresponding only to Google Updates as per Moz's reports. Whether Google Panda or Google Penguin hit your site, this type of analysis should do the trick in identifying the direction you should go from now on, which we will discuss in the following. - duplicate content issues: having unique meta tags set up for each of your pages can be a tremendous help in this case, as you can see the number of Duplicate Meta Titles and Duplicate Meta Descriptions in Google Webmaster Tools, which usually gives you a hint if you have a problem in this direction due to programing. - for ideas on content you can take a quick peek at what your competitors are doing (especially those who are outranking you). Of course, every idea you get from them should be carefully considered if it could apply in your case as well. - who links to your site: use Google Webmaster Tools for this purpose. Analyze the quality of these sites: look at domain authority (should be at least 30) and the ratio of their Total Links/Total Linking Root Domains (should be as close to 1 as possible) in Open Site Explorer, and maybe even Page Rank, although it's not as accurate as it used to be. - how many links do they have to your site and how many pages do they link to: thus the Links/Linked Pages (taken from Google Webmaster Tools) ratio should be as close to 1 as it can get. If you have thousands of links which lead to the same page on you site, that is a definite alarm signal. - what kind of link it is: where it's located on the site which links to you (blogrool, footer and other sidewide links are a definite no-no), if it is a paid/affiliate link (these should all have the "nofollow" attribute attached) and so on. - the anchor text of your links: use Open site Explorer and Ahrefs to analyze this aspect of your links. Branded anchor text should obviously dominate and you should be careful if some non-branded keywords have a high percentage in your anchor text profile. - If you have sitewide links from authoritative domains in your industry (to the same page on your site), then you are in somewhat of a pickle. You should consider that if you add the nofollow attribute to all of those links, you might get hurt as it won't pass any potential link juice and in the end a link from an authority site in your field is a definite plus. Thus, if possible, you should keep the link from the homepage dofollow and to the rest add the nofollow attribute. Of course, this means that you are in good relations with the respective company. - links from low quality sites, which don't bring you a significant amount of traffic, should be removed. Contact the webmaster of the respective site, follow-up, document everything in a Google Drive spreadsheet and if the links is still live, use Google's Disavow Tool (but do use it with precaution!). If a low quality site does bring you converting traffic, adding a nofollow attribute might be the best solution. - if you notice that you have an over-optimized anchor text profile, you have some work cut out for you. You need to identify the site from which you have links with that particular anchor text and either change the anchor text or remove the link. Google changed the way it was handling exact-match domains back in 2012, thus reducing the presence of low quality EMDs.Thus, those site which have exact-match domains aren't favored anymore. In this case everything we talked about in this article holds true: work on having a great site and this sort of updates won't effect you that much even if you have an exact-match domain. Well, that's basically it. I'm looking forward to hear you thoughts and experiences with Google algorithm updates and everything that impacts Google SERPs in the comment section below!